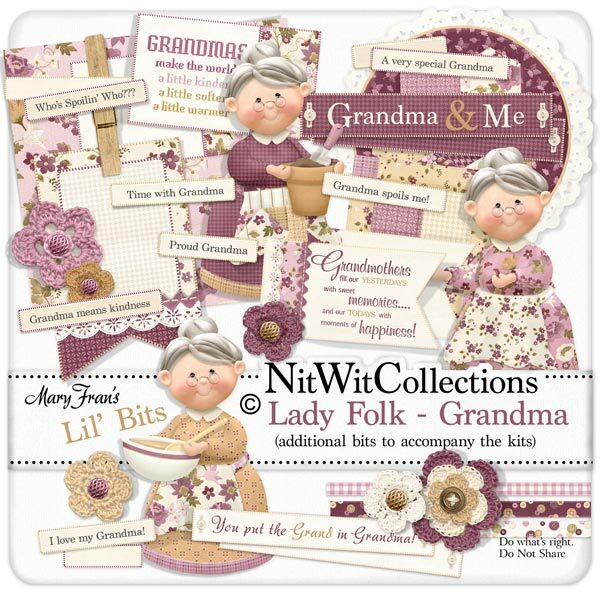 Lil' Bits "Lady Folk Grandma" adds in the Grandmother characters and sentiments and is the perfect companion element pack to coordinate with FQB - Lady Folk Collection. Don't mistake this as only for a grandmother theme Lil Bits pack! As there are only the 3 grandmother characters don't miss out on all of the other "non-grandmother" elements if you are not using it for this theme. These digital elements are NOT included in the FQB "Lady Folk" Collection so don't pass these by! 6 Crochet flowers - don't they look like you could peel them off the screen?? 1 Quilt round - almost looks like a needle point round? 1 Quilt square - oooh to have a quilt from those years! 12 Wordstrips - some with sentiments and some are blank as we know that everyone has a different word for grandma and we wanted you to be able to personalize your cards and layouts with these in using it for a non-grandmother theme.